The notoriously dirty Gowanus Canal. 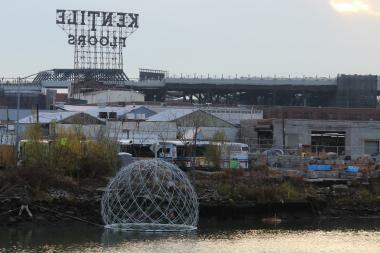 The Gowanus neighborhood is hosting its first-ever TEDx conference in January 2014. GOWANUS — It's a cesspool of innovation. A neighborhood best known for its filthy canal will soon play host to a conference where speakers will present "Gowanus-inspired ideas." Gowanus will host its first-ever TEDx conference on Jan. 26, where "designers, entrepreneurs, artists, historians and community leaders" will speak on the theme of "Inspiring Community," according to the event website. "We are passionate about bringing TEDx to Gowanus because this area is a perfect representation of the culture, innovation and change that are dominating the new Brooklyn landscape," TEDxGowanus organizer Sean Gannet said in a statement. Speakers at the daylong event, which was first reported on by Pardon Me For Asking, will include the leaders of local nonprofits and neighborhood groups. Hans Hesselein of the Gowanus Canal Conservancy, Marlene Donnelly of Friends and Residents of Greater Gowanus and Joseph Alexiou, who's writing a book about the history of the Gowanus Canal, are scheduled to appear. Not all of the talks will have a direct connection to Gowanus. Radio host Reggie Ossé will discuss "hip-hop's journey from counterculture to pop culture," and Rachel Fershleiser, who does "literary and nonprofit outreach" for Tumblr, will talk about "Internet-enabled literary communities." TEDx conferences are independent, locally organized versions of the yearly TED Talks events, where "the world's leading thinkers" speak before live audiences. Videos of TED Talks often garner millions of views online. TED stands for technology, entertainment and design, and past speakers have included Bill Gates, Steve Jobs and Sheryl Sandberg. New York has seen a several TEDx conferences based in specific neighborhoods, including Gramercy Park and the Financial District. In Harlem, TEDx conference organizers were criticized as being "elitist" for charging $100 per ticket. The cost was later lowered. Gowanus TEDx released an early round of tickets for $25, which are now sold out. Remaining tickets are $50 each and include a pass to three speaker sessions and an "interactive exhibit hall." There's room for 200 attendees, and the conference will be broadcast live online at www.TEDxGowanus.com. The conference will take place at The Green Building and its sister venue 501 Union, both of which are on Union Street between the canal and Bond Street. Event organizers did not immediately respond to a request for comment on Friday.